TÉRAPOTM – BRIMMING WITH NATURE ! 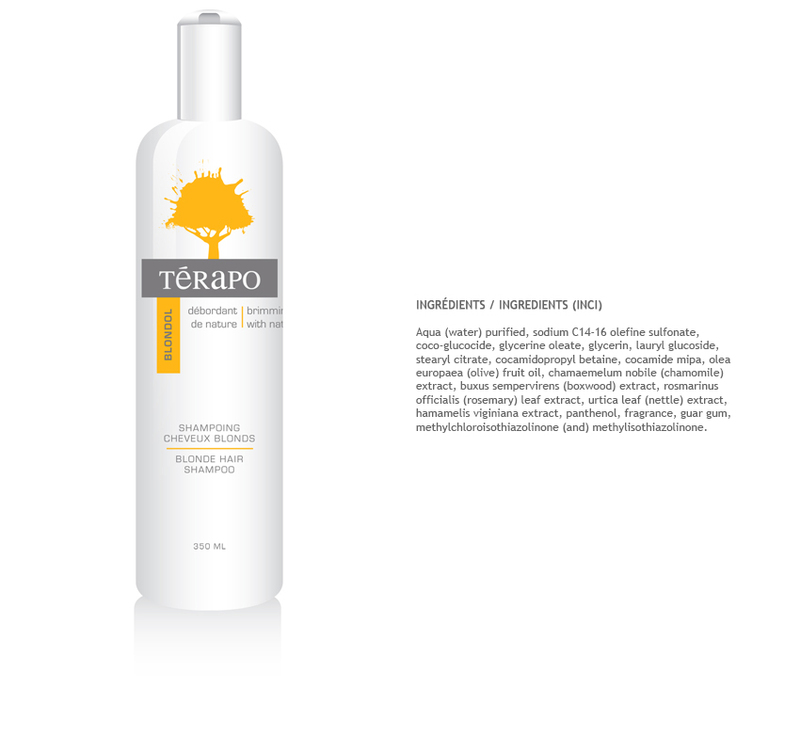 TÉRAPOMC keeps enhancing its daily hair care formulas for all types of hair to offer its clients sulphate, silicone, and deposit-free products without sacrificing quality. Made with 100% natural ingredients, the TÉRAPOMC line has been especially created for professionals like you, and is sure to please those salons committed to offer products made with concentrated natural ingredients that make a true difference. TÉRAPOMC, Brimming with Nature! More than a slogan, it’s our vision and desire to provide high-end products with a strong concentration of natural active ingredients. 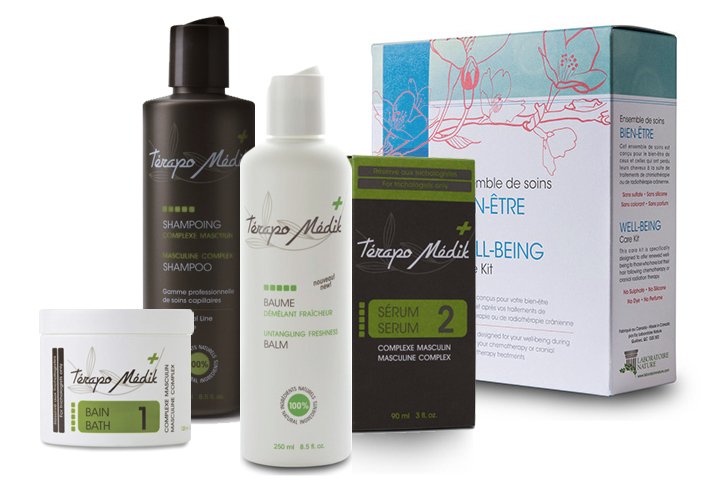 These gentle and unique formulas made right here in Quebec are now available to you. Offer that little extra to your own clients! 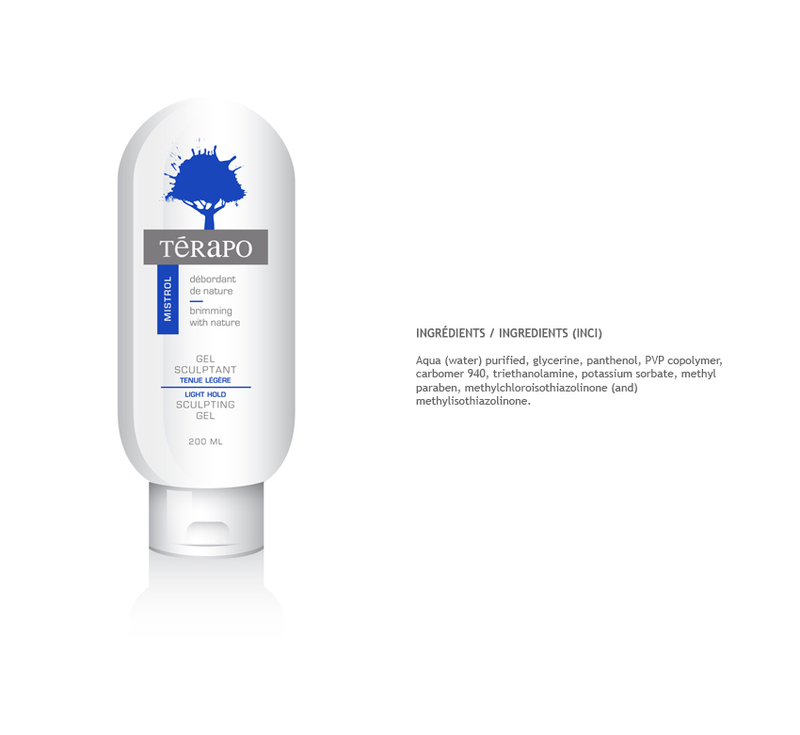 We are pleased to introduce TÉRAPOMC. Nurture and protect color-treated hair with this Shampoo, brimming with natural ingredients that ensure protection and moisturization for even the most fragile hair types. For even more spectacular results, use with Kératinol Conditioner. 100% natural ingredients: Contains witch hazel extract, olive and sweet almond oils, vegetable glycerin, hydrolyzed keratin proteins, linden bud cryo-extracts, superior plant moisturization and concentrated plant-based multi-vitamins (A, E, F and H). This moisturizing elixir, brimming with natural ingredients, will make your hair shine and protect it from external aggression without weighing it down. For superior protection and hydration, use with Kératinol No Rinse Emulsion. 100% natural ingredients: Contains avocado and olive oils, hydrolyzed keratin proteins, linden bud cryo-extracts, lecithin and vegetable glycerin. Coloring, bleaching, flat ironing…does your hair need more intense moisturization? This no-rinse cream is brimming with natural ingredients that restore your hair to its natural brightness without weighing it down and with no build-up whatsoever. 100% natural ingredients: Contains avocado and olive oils, hydrolyzed keratin proteins, linden bud cryo-extracts, lecithin, provitamin B5, vegetable glycerin and concentrated plant-based multi-vitamins (A, E, F and H). Curly HairPamper your curls with a Shampoo brimming with natural ingredients that ensure bounce without weighing them down. For even more elasticity, use with Tricho-perm Conditioner. 100% natural ingredients: Contains box tree, nettle and witch hazel extracts, olive oil, vegetable glycerin, hydrolyzed wheat proteins and provitamin B5. Flaunt your curls thanks to this custom Conditioner brimming with natural ingredients, ensuring your curls have bounce and shine without being weighted down. 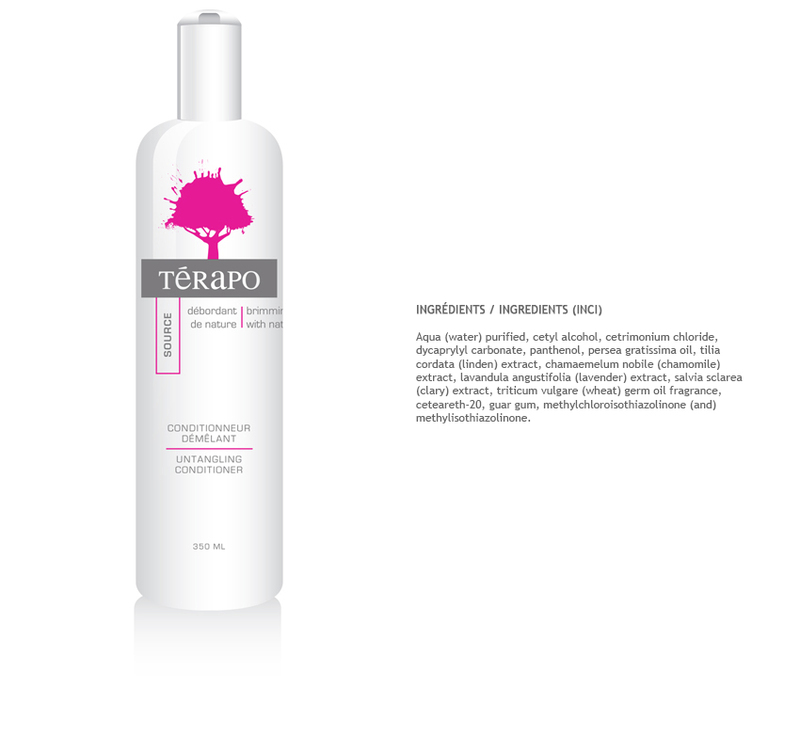 For even better defined curls, use with Tricho-perm No Rinse Emulsion. 100% natural ingredients: Contains box tree, camomile and rosemary extracts, avocado and olive oils, linden bud cryo-extracts, concentrated plant-based multi-vitamins (A, E, F and H), vegetable glycerin, hydrolyzed wheat proteins and biological sulfur. Want to give more definition to your curls? This Emulsion, brimming with natural ingredients, adds extra shine and bounce to even the most demanding curly hair. Let your fine hair find all its natural exuberance thanks to this Shampoo, brimming with natural ingredients that provide extra thickness and shine. For even more volume, use together with Voluminol Conditioner. 100% natural ingredients: Contains witch hazel, camomile, walnut, box tree and burdock extracts, avocado oil, vegetable glycerin and hydrolyzed wheat proteins. Manage your fine hair with this unique Conditioner brimming with natural ingredients and designed to increase volume while decreasing static electricity. For superior protection and moisturization, use with Voluminol No Rinse Capillary Milk. 100% natural ingredients: Contains camomile, box tree, horsetail and linden extracts, avocado, arnica and olive oils, linden bud cryo-extracts, hydrolyzed wheat proteins and vegetable glycerin. Want to dramatically add volume to your fine hair? This Capillary Milk, brimming with natural ingredients, creates intense volume without weighing your hair down, and helps control static. 100% natural ingredients: Contains camomile, box tree, horsetail and linden extracts, avocado, arnica and olive oils, linden bud cryo-extracts and hydrolyzed wheat proteins. Drive out the yellow tints with this Shampoo brimming with natural ingredients that controls yellowing without leaving a blue residue. For even better results, use with Blouffol No Rinse Emulsion. 100% natural ingredients: Contains burdock, box tree, nettle and witch hazel extracts, St. John’s Wort and olive oils, hydrolyzed wheat proteins, lecithin, provitamin B5, vegetable glycerin, essential mint and Agent Purple 2. No more worries about yellow tints! This Emul- sion, brimming with protective and moisturizing natural ingredients, will become your perfect anti-yellowing ally. 100% natural ingredients: Contains box tree, nettle and witch hazel extracts, olive, wheatgerm, arnica and avocado oils, hydrolyzed wheat proteins, lecithin, provitamin B5, vegetable glycerin, concentrated plant-based multi-vitamins (A, E, F and H) and Purple 2. 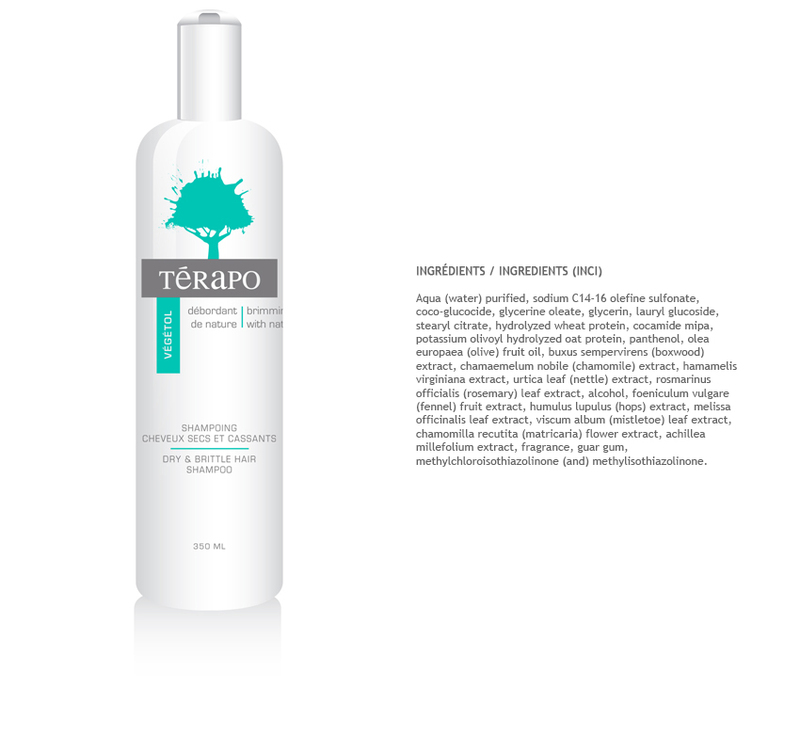 Eliminate the build-up and residue in your hair that dull the shine and weigh the hair down, thanks to this cleansing Shampoo, brimming with natural ingredients, specifically designed to thoroughly clean residue left by shampoos, conditioners and other styling products. 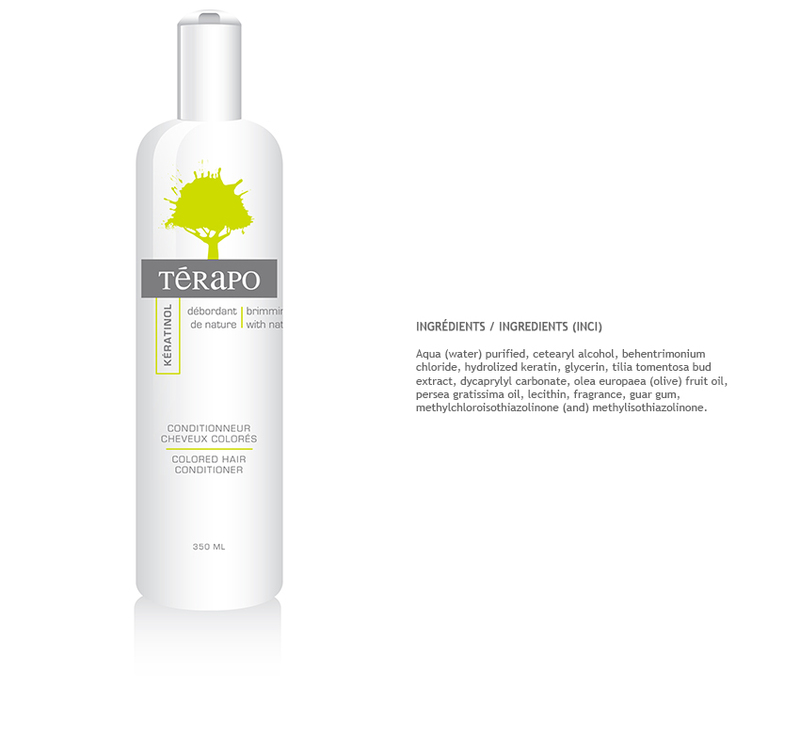 For even better results, use with Révitol Sealing Conditioner from the Térapo range. 100% natural ingredients: Contains box tree, birch, nettle and witch hazel extracts, St. John’s Wort and eucalyptus oils and vegetable glycerin. Preserve the color of your naturally blonde hair with this special Shampoo brimming with natural ingredients, specifically designed to enhance the shimmering honey tones of your hair. For even more striking results, use with a Térapo Conditioner or Emulsion. 100% natural ingredients: Contains camomile, box tree, rosemary, nettle and witch hazel extracts, olive oil, vegetable glycerin and provitamin B5. Give your hair a well-deserved break thanks to this Shampoo, brimming with natural ingredients. 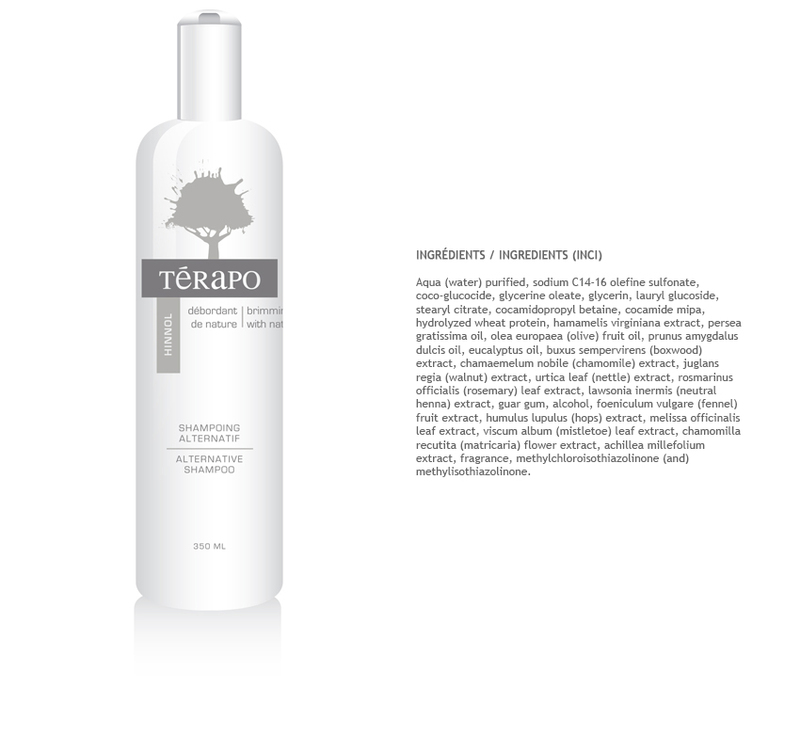 Smoothly soft and rich in plant extracts, it can be used for all hair types thanks to its neutral pH. Alternate this Shampoo with other Shampoos in the Térapo range. 100% natural ingredients: Contains box tree, camomile, walnut, nettle, rosemary, henna and witch hazel extracts, avocado, olive, sweet almond and eucalyptus oils, hydrolyzed wheat proteins and vegetable glycerin. Offer your thirsty hair a true beauty bath, brimming with natural ingredients, adding strength and shine to even the most dehydrated of hair. And for an even more brilliant glow, use with Térapo Conditioner or Emulsion. 100% natural ingredients: Contains witch hazel, camomile, nettle, walnut, box tree and rosemary extracts, olive oil, vegetable glycerin, oat and hydrolyzed wheat proteins as well as plant balms and hop-based extracts specially combined to combat dryness. Tame your unruly hair with this Conditioner brimming with natural ingredients, designed to seal hair cuticles for smoother and easier-to-manage hair. For even better results, use as a final step after salon hair treatments to seal in the beneficial elements. 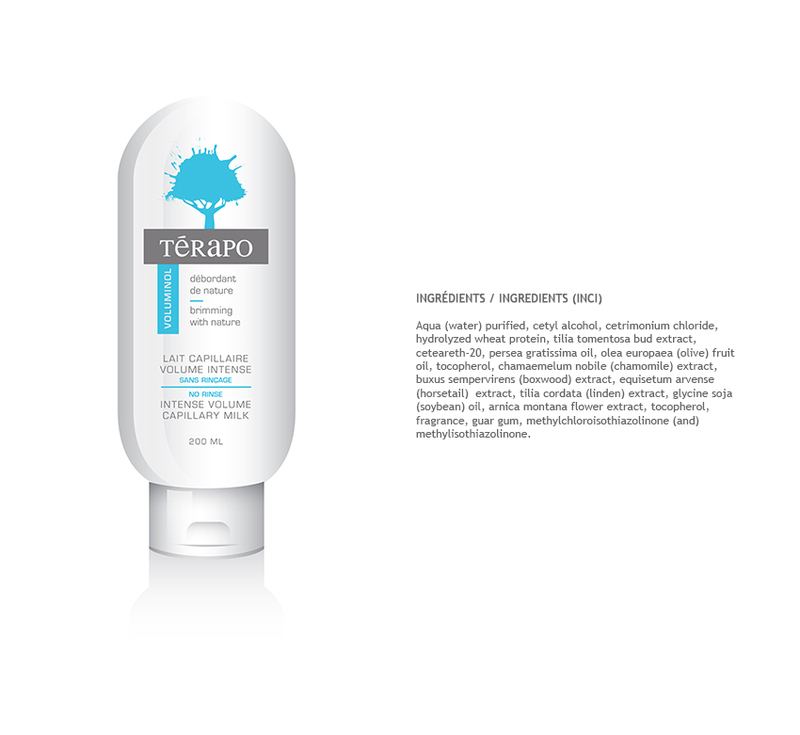 100% natural ingredients: Contains oak, camomile, linden and lavender extracts, avocado and olive oils, provitamin B5, hydrolyzed wheat proteins and citric acid. Transform your ordinary hair into extraordinary hair! 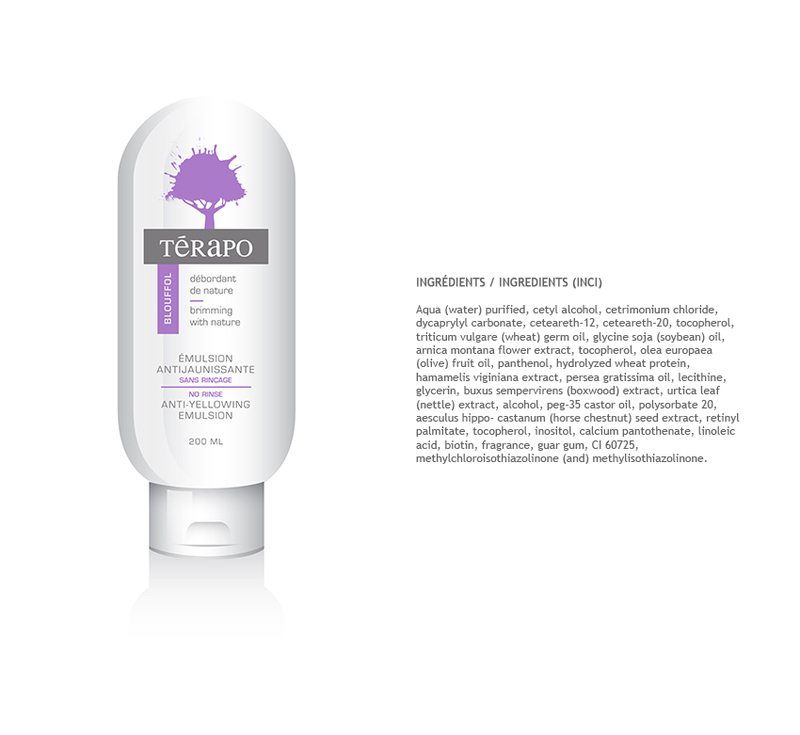 This Conditioner brimming with natural ingredients is designed to moisturize without ever weighing your hair down, for easy-to-style hair that shines with health. 100% natural ingredients: Contains linden, camomile, sage and lavender extracts, avocado oil, wheat germ and concentrated provitamin B5. Be stylish without worrying about residues! This light hold hair gel, specially created for blow-dried and fine hair, lets you shape your hair without weighing it down. It can be easily removed by a quick brushing and disappears completely by simply rinsing in clear water. 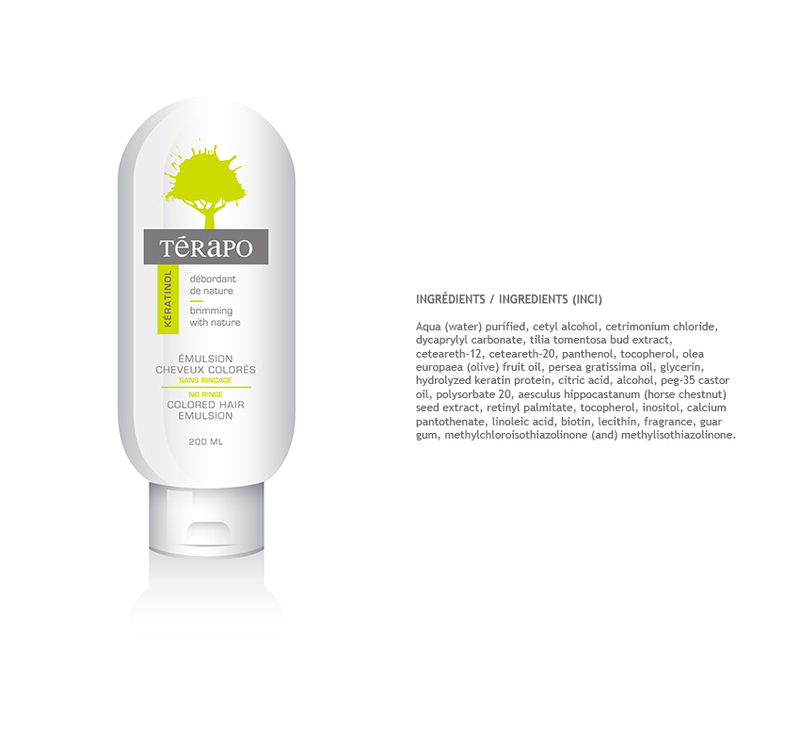 Natural ingredients : Contains vegetable glycerin and provitamin B5.